a red brick building in the McBurney Park neighbourhood. The cornerstone was laid on May 22, 1932 and blessed by ​Archbishop M.J. O’Brien on September 6, 1932. Our school features large classrooms with high ceilings and large windows ​allowing for natural light in all classrooms. Through active play and work, our outdoor spaces foster the growth of healthy children and respectful friendships. through opportunities to ​build, invent, and create. and a safe, inclusive and accepting school environment, which is essential for student well-being. 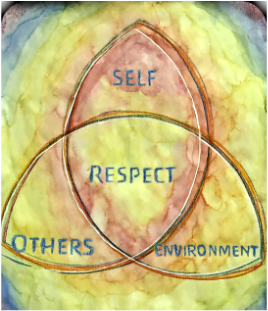 Our school code is: respect ourselves, respect others and respect our environment. In 1993, Mulberry School began as a Waldorf Initiative playgroup. and, in 1996, we moved to the former Glenburnie West School, located just outside the city. We had plans to buy this two-room country schoolhouse; however, the presence of leaking underground oil tanks prevented us from doing so. In 1999, we arranged to lease the former St. John’s Catholic School, in downtown Kingston. A series of short-term leases, then a five-year lease, offered us time to grow and stabilize our pedagogical and administrative foundations. ​Being downtown also provided us the ability to expand enrollment and be part of a lively and culturally supportive neighbourhood. we negotiated the purchase of our present school building. We continue to maintain and renovate our school, preserving the original symmetrical architecture with terrazzo and hardwood floors, marble door sills, large windows, and soaring ceilings. 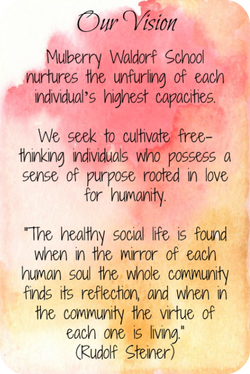 Mulberry Waldorf School is dedicated to honouring our links to the past and continuing to welcome generations of students and their families to come. ​Many thanks to Josh Lyon and "fertile grounds" for this wonderful time lapse video!